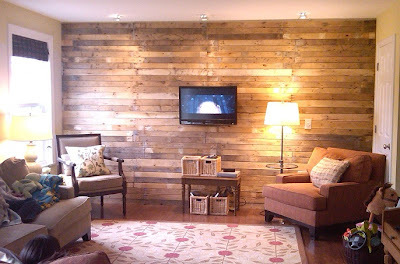 I wondered what happened to your pallet wall post....this is how I found your blog in the first place. Tried to show it to my husband a couple weeks ago and it was gone! Glad you posted it again - it's fabulous! 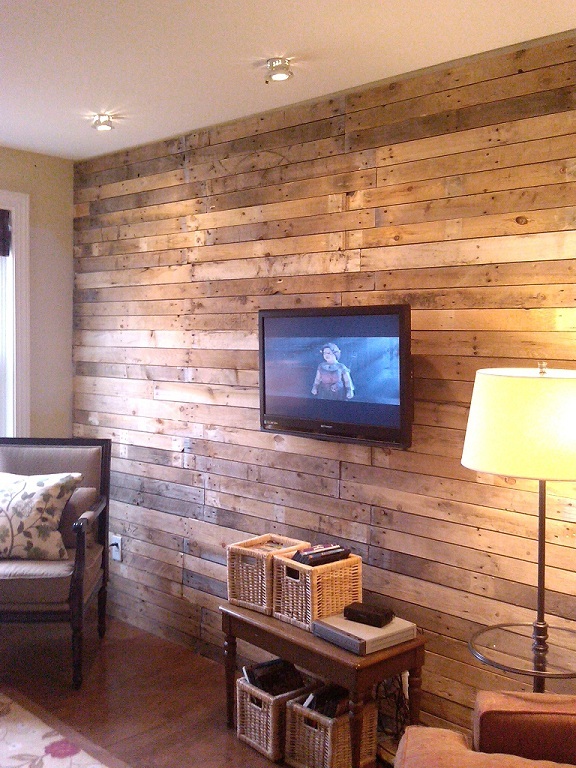 I loved that pallet wall from the first day I saw it on your blog. How rude of the turner-inner. Keep the post alive! I'm a little upset - I think this was malicious. My original post was pinned on Pinterest maybe 30k times, so all of that traffic just goes to a "this post cannot be found" error now. You should be able to set up a link redirect, such that any traffic that goes to the old link is redirected to this one rather than seeing the 'post cannot be found' error. 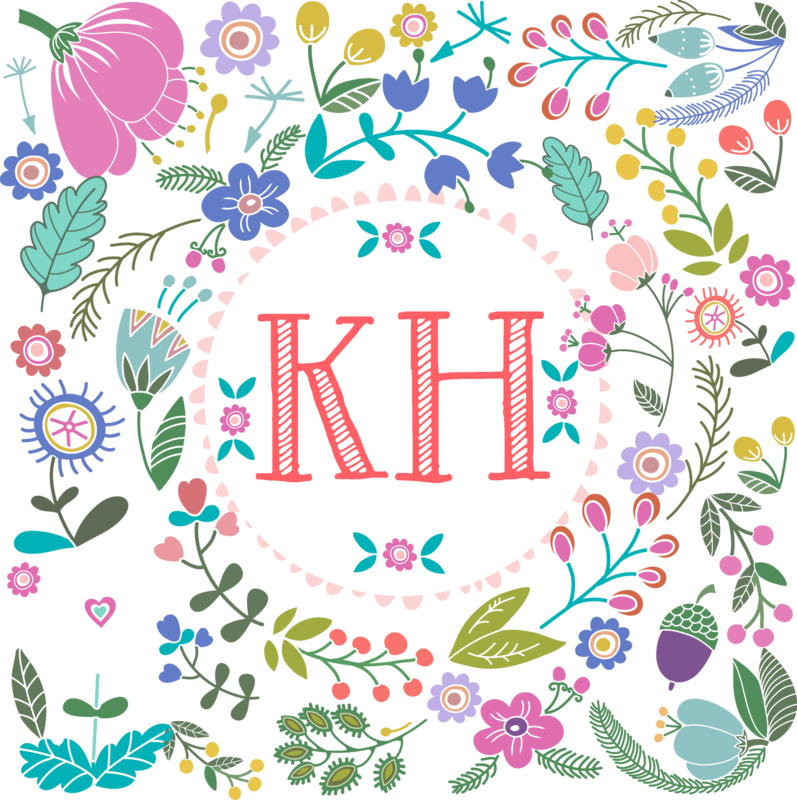 Oh, while I'm here (sorry I've got to make another post, since my comment is hidden while waiting approval I can't exactly edit it- and that's assuming I'd be able to edit it to begin with...) can I get your opinion on an idea I had? How do you think this kind of wall system would look with planks (narrow wedges formed by repeatedly splitting a log like cutting a really tall pizza/pie into a lot of pieces) rather than boards? You did a Great Job!! Sorry about the confusion with Google. I was just thinking about your orig. 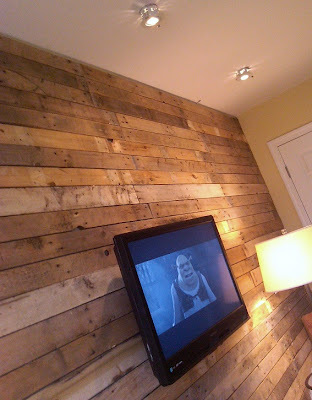 post the other day when I caught part of Kitchen Cousins on DIY/HGTV. 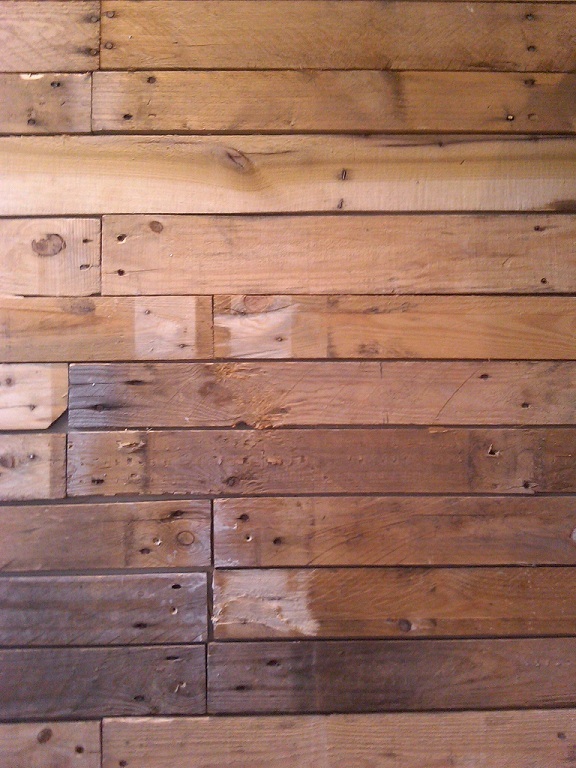 They did their own pallet wall on a restaraunt renov. & it looked almost as good as yours. Hey Katy, Glad it's back up now! Thanks for the info about treated pallets! Good to know! That is awesome! My husband has tons of pallets they throw out at work. 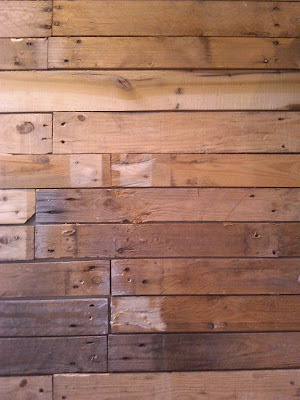 I have my wall all picked out.I might even do the ceiling! I'm glad you re-posted it - your pallet wall is amazing. Very nice work. I d like to ask about the cables. Was there any other way to hide the cables behind the pallets? Have you thought of hanging anything such as shelves for books for example? I guess you need to screw through both the pallets and the wall behind, right? 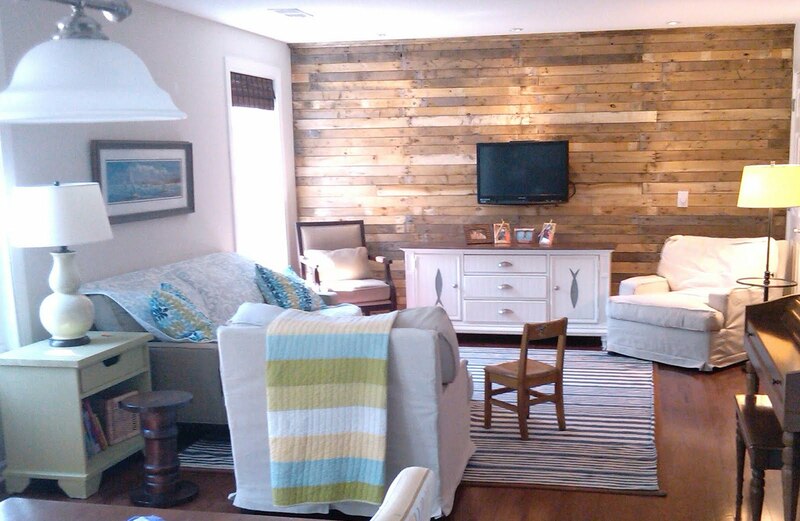 "I have been thinking about revamping this whole wall because I think I am tired of it. I don't know yet what direction that will take, though..."
Do you know if there's anyway to tell if a pallet has been treated? I'd like to do this also, but concerned about putting treated pallets up. Andy - ask. I too worked at a place where we used pallets & can tell you most are not treated. The only ones we ever used that were treated had specific marking to indicate it & some were treated to various degrees dependent on governmental requirements to eliminate any chance of tag along pests. Domestic pallets require NONE & therefore it would be highly improbable they'd have been treated as treating costs money & no one spends money to treat wood when it isn't required. International pallets are marked to show the types of treatments received. So if there is no marking, there is no treatment. If there is a marking that has the IPPC logo, you don't want it. That is the International Plant Protection convention stamp & means that wood is intended for international use. 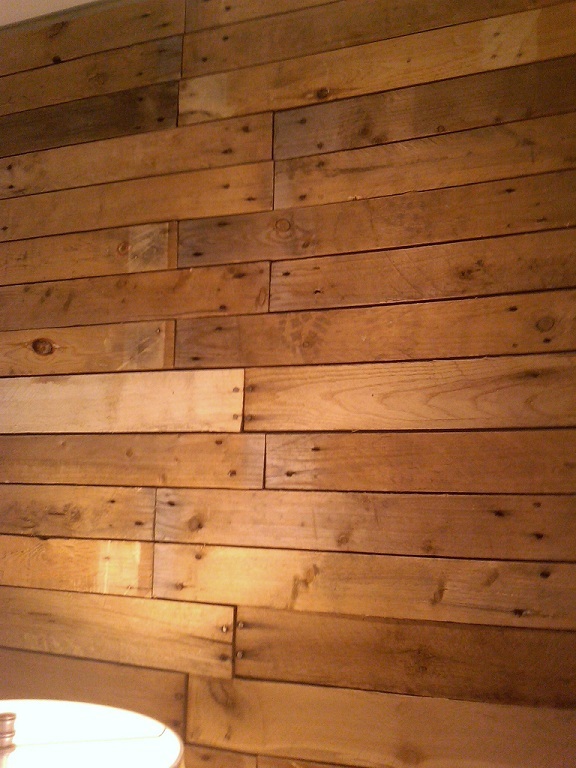 You also don't want anything that is noticeable dirty with potential hazards (spills - food residues, etc). 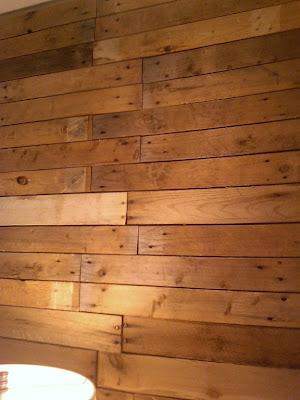 You can also buy them new from Uline if you don't mind buying them & just want the look of palette wood. Loved it the first time, love it the second time. GRAND work young'un! I LOVE IT!!!! I dont care who did it first or best. This is your project and I love the improvement. I am dabling in pallets right now and I'm using tons of ideas I see on line, like yours! I've got back deck furninture, a spool chair and table, tons of wall pretties and next is the accent wall. You keep going girl, make pretties till yer fingers fall off. You're doing amazing!!! !